On the 8th June, 1797, the Elector Charles Theodor, founded a military decoration of honour, which King Maximilian Joseph transformed into a royal Order under the above title, on the 1st March, 1806, the day when the Bavarian Prince assumed the title of King. It is formed after, and to the same purpose as the Baden Order of Military Merit of Charles Frederick. That the Order is held in high estimation, is owined to the extra advantages and privileges attached to it. The six senior Knights of the Grand Cross, the eight senior Commanders, and the fifty senior Knights receive an annual pension of 1500, 500, and 300 fl. (£150, £50 and £30) respectively. Every Bavarian commoner becomes ennobled with his nomination, and if his father and grandfather were also members of the Order, the nobility becomes hereditary in the family. The funeral of a deceased member is attended with ceremonies prescribed for that of one rank above his own. To these personal privileges, King Louis added (27th February, 1835) the following benefits for the children of the members. An annuity of 300 fl. (£30) is granted every year to eight children of living or deceased members, namely : to males until their twenty-fifth year of age, and to females until they are naarried, or in some way provided for, otherwise the grant continues for life ; and the same is the case also with males if incapable of gaining a livelihood from physical defects or infirmities. The decoration is a gold white enam.elled cross with golden rays in the corners, placed under a royal crown. 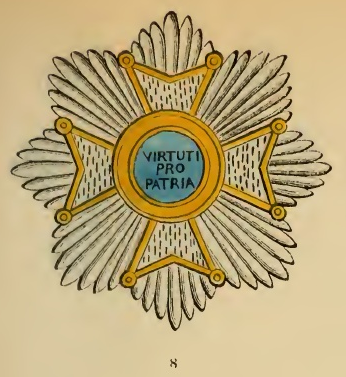 The blue enamelled middle shows on the obverse the initials in gold of the royal founder, Maximilian Joseph, and on the reverse, equally in gold, the motto of the Order : "Virtuti pro patria" (To valour for the fatherland). The Knights wear it (Nos. 9 and 10) upon the left side of the breast, suspended by a black ribbon with narrow white and blue borders. The Commanders wear it round the neck, while the Knights of the Grand Cross suspend it across the right shoulder, or round the neck, and have, in addition, attached upon the left breast an embroidered star (No. 8). The size of the decoration accords with the class occupied by the members.